Keeping in mind thigh width, leg length, not to mention torso, and hip measurements, shopping for a great pair of shorts is for the patient and non-jaded lady. So over the years of skipping shorts shopping all together, I've taken the high road (the sky high road) and focused my potential on the mini. Like shorts, I can pull one on and go. But unlike shorts, I don't have to worry about the boring details like my measurements in order to find the right one. With minis, there's lots of "right ones". 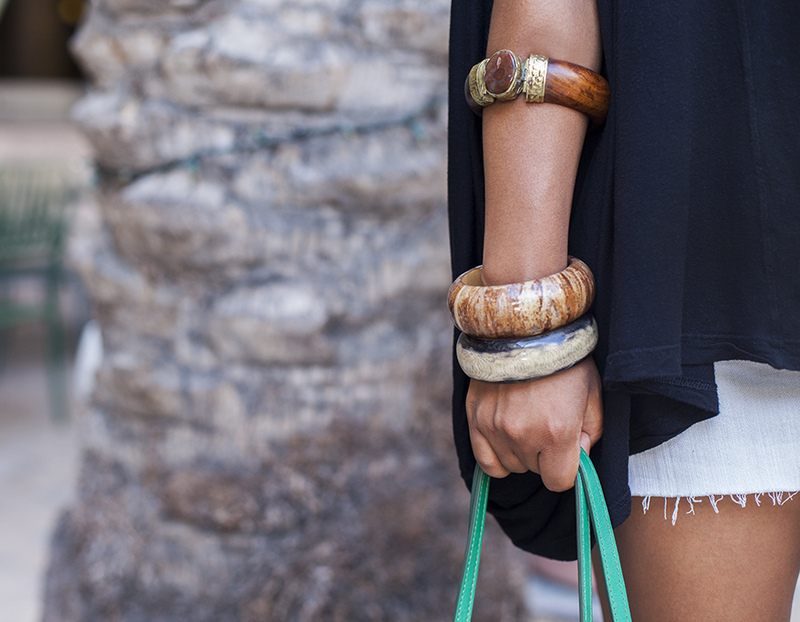 [these jumbo bangles are a staple accessory!! Bangles like these are not just for Summer though they're definitely indicative of resort wear. Strolling through an outdoor mall in Glendale, I realized I don't actually have a lot of mini skirts.... not that I need a wardrobe full of them but it occurred to me that the only reason I didn't have more is because I've never lived in a consistently warm/sunny climate. So now that I'm here in L.A., living it up in a desert lifestyle, I should probably find a couple more minis to coordinate with my oversize, drapy tops. because if you just have one, you'll wear it out and that's not cute. Just sayin'. Saw the movie Elysium after our day of strolling. If you wanna see Matt Damon all tatted up and thug like, you should go. Not gonna lie, I dug it. Love the simplicity of your looks. The style is in the details. Ugh, i have the WORST time finding shorts. I've given up on them fitting in the hips AND the waist, but even when I can find ones that fit in the hips they're still super tight on my legs! Does everyone have ridiculously skinny thighs as compared to their hips nowadays? Geez!! I hear ya sister. Keep calm and buy a mini LOL! LMAO @ all tatted up and thug-like. I'm into it! Will check it out. You choose the mini: and you were right! You look great! Hi there, I just thought I'd stop and say hi! I've been reading your blog for quite awhile but I dont think I've ever commented! Bad, bad reader, I know. Anywho's I think your blog is fantastic keep up the good posts! Ps. the outfit lovely...naturally! Happy Wednesday! Such a great look on you. Hmm, how about you make your own tees? Just a thought!! And I would too if I had legs like yours! Love this look, I really like how you styled this skirt!! Very cute look! You wear that mini well. Ohh why are you so beautiful? so natural? so positive? I love it! Keep shining girl! I fell in love with the look you styled here way last year, especially your top. I sew too and have been planning on knocking off the the top design. Couldn't find it no where on the Asos website though. I want to show your picture of the top on my blog if it's alright with you. I could even crop the picture so that your face would not show if you would rather that I did that. Promise you I'm not crazy, just crazy in love with your top. My email is fayedoll (at) cox (dot) net if you care to answer.